Nanny Poppinz is A 27/40 Company. 27 Years Old and 40 Thousand Happy Families! The Best Agency & Services for Your Needs! The best kept secret has been let out of the bag. Nanny Poppinz in San Antonio is open to service your every Nanny child care need! Nanny Poppinz San Antonio agency services include everything from hotel baby sitting, emergency over night care, holiday care, "teacher work day" care, full-time or part-time Nanny service, live-in or live-out Nanny, newborn/infant specialist care, date night Nanny, and after school Nannies. We even have emergency on call Nannies to look after children who are sick and unable to attend school. Nanny Poppinz also provides corporate care and currently is providing stadium care for the Miami Dolphins, Miami Marlins, and the Florida Panthers. The only company in San Antonio that offers The Back-up Care Service - We quickly reposnd to you! We provide temps, emergency full time and part time care, live in and live outs. We also provide hotel care, care to companies for there events: military, weddings, parties, picnics and conventions! The Nanny Poppinz Agency of San Antonio understands the importance of finding the best possible Nanny care for our most precious assets, our children. Many families choose a Nanny to care for their children due to flexibility with schedules, a lower occurrence of illness, customized one on one care, and a comfortable and SAFE AT HOME family environment. Nanny Poppinz has successfully referred a Nanny to over 40,000 happy families since 1992. The most sophisticated Nanny background checking process in the Nanny industry. Nanny Poppinz is providing stadium childcare for The Miami Dolphins, Florida Panthers and the Miami Marlins. NO FEES of any kind unless and until you hire your San Antonio Nanny. FREE in home consultation direct with the owner. Nanny Poppinz offers a 6 month replacement guarantee if you hire a full time Nanny or part time Nanny. A "Live" Nanny call center available to San Antonio 24/7 including evenings, holidays and weekends. We personally meet and face-to-face interview each and every Nanny before we send them to your home. All Nanny referrals have 3 years verifiable Nanny childcare work experience and CPR certification including AED and First Aid training. Each Nanny is legal to work in San Antonio. Emergency Nanny childcare service and 6 month Nanny replacement guarantee for all full & part time Nanny Poppinz San Antonio families. This Nanny replacement guarantee is the best in the Nanny industry. We excel at professional placement and many Nanny and child care services to make sure you get the best service. Proudly offers Nanny referral fee discounts to military, law enforcement and Federal Government families. Industry Leading "peace of mind"
The Nanny Poppinz Agency of San Antonio, Texas is available 24 hours per day, 7 days per week for our families because we as moms ourselves know that child care emergencies do not happen from 9am to 5pm Monday through Friday. When you call you will speak to a service representative of Nanny Poppinz who will listen to your needs and solve your childcare problem no matter the time of day or night. Our clients tell us that this Nanny service and availability ANYTIME gives them "peace of mind". One of the greatest service benefits to Nanny Poppinz of San Antonio is that the owner, DeeDee Pubien, is a Registered Nurse and has over five years of child care work experience directly with children. DeeDee is also a mother of two and knows what it is like to have to juggle work, children and home. Furthermore, she is a former Nanny with Nanny Poppinz and is fully aware of the duties that the Nanny is expected to fill. We are confident that the Nanny Poppinz of San Antonio Agency will become an important part of San Antonio area, helping families to find their optimum Nanny child care solutions. Give us a call so that we can help you with ALL of your Nanny child care and domestic needs. Let us prove that we will do it all, so that you don't have to. We look forward to working with you! Call us at 210-775-2185. 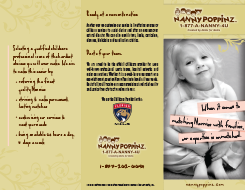 Please note that Nanny Poppinz provides reduced Nanny referral fees for our Military and Law Enforcement families.